The Lobo System -- combining flexibility with strength. PLANT and maintenance engineers in Australia can benefit from one of the world's most advanced access systems for working safely at height. 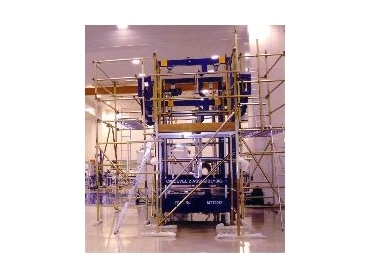 The Lobo System is a versatile work platform that combines the flexibility and strength of traditional scaffolding with the simplicity and mobility of tower systems. Comprising steel components that adjust to meet specific requirements, the system can be erected quickly and easily without the need for tools. Australian distributor Tony Wright of Roofsafe-T-Systems says the Lobo System is the safest option for all work up to a height of 6m or more. The basic elements of the Lobo System are trestle legs, with adjustable clamps on the top, fixed bracing clamps on the side, and steel or aluminium tubes with the same diameter as standard scaffolding tubes. The tubes are passed through the clamps and tightened by hand to form a framework to which the other components are added. Individual components of the system pack away easily and compactly for storage and transport, while their size and portability make the system suitable for use wherever space is restricted or access difficult. Robert Bokros, director of Lobo Systems, says health and safety is possibly the single most significant factor affecting the modern workforce. “No matter where it is being used, Lobo provides the perfect, tailor-made access solution, making it safer and more efficient." Organisations that currently use Lobo include Anheuser Busch, BAE Systems, General Electric, General Motors, Miller Brewing, NASA, the UK's Royal Air Force and police forces, the United States Navy, and Virgin Atlantic.